One of Charlie's finest! In his own words: "One thing I wanted to do was approach improvisation in a more contrapuntal way. Dixieland is the first thing that comes to mind in terms of contrapuntal jazz, but I didn't necessarily want to follow the Dixieland rules." You'll be glad Charlie decided to break the rulesthe results are fantastic! With Ken Peplowski on clarinet, Chuck Redd on drums, and Bill Douglass on Bass. Don't miss this one. A Django Reinhardt tribute with a twist. 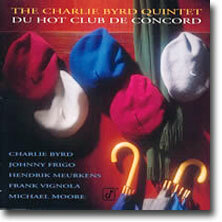 Charlie assembled a "Quintette of the Hot Club of France" type of combo for the album: Byrd and Frank Vignola on guitar, Johnny Frigo on violin, Michael Moore on bass and Hendrik Meurkens on harmonica. (Did you know that harmonica virtuoso Larry Adler recorded with the QHCF in 1938?) The twist is that there are no Reinhardt tunes here, and few attempts to imitate the sounds of the QHCF. Instead, it is the spirit of Django Reinhardt's music we hear. Listen to Swing '59 or Gypsy Boots, two Byrd originals written with Django in mind. Or read the list of song titles below. A first glance, they appear to have no connection to Django, but listen to the tracks and you'll hear how well they fit into the quintet's style. Django was known for his musical exploration. 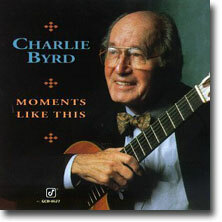 By reversing the formula for jazz tribute albums, Charlie has created perhaps the most profound tribute to Django yet. Highly recommended. 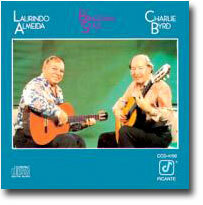 Here's the very popular, Grammy-nominated Concord CD of classic duets by Charlie Byrd and Laurindo Almeidaconsidered by most to be the best of their many collaborations. Guitarists will be happy to know that eight of the duets have been transcribed and published in Laurindo's Complete Anthology of Latin American Guitar Duets, available from Guitarist's Forum.